The Drawbridges of Pinellas County and elsewhere! Dedicated to the bridge tenders of Pinellas County and elsewhere who work tirelessly to get you where you want to go for both motorists and boaters alike! Welcome to a specialty site courtesy of the webmaster that brings you EdwardRingwald.com and Interstate275Florida.com! Originally known as the Drawbridges of the Pinellas Beaches at EdwardRingwald.com, the pictures and information grew by leaps and bounds that it deserved a web site of its own and its very own domain - DrawBridgeAhead.com. Now when you type this domain name into your browser, you will come right here instead to a specific page at EdwardRingwald.com. 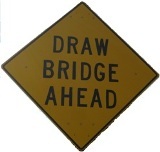 What you'll see on DrawbridgeAhead.com! The drawbridge. You know, the kind of bridge that inconveniences you and I when a high boat has to pass through. For us Floridians the drawbridge is a way of life especially when you are on the beaches of the Pinellas Suncoast or the beaches of the Ft. Lauderdale/Miami area, as well as further inland crossing the Hillsborough River in downtown Tampa or crossing the St. Johns River in the northeast part of our great state. Here we'll start our coverage with the bridges of the Pinellas Suncoast beaches from the Tierra Verde Bridge near Ft. DeSoto Park on the southern tip of St. Petersburg all the way up the Gulf Intracoastal Waterway to the Dunedin Causeway in Dunedin, not to forget Pinellas County's best kept drawbridge secret in Tarpon Springs, the Beckett Bridge. As space permits we'll add more Florida locations for your viewing enjoyment. So sit back and enjoy the drawbridges of Pinellas County and elsewhere from the comfort and convenience of your Internet browser. Instead of being behind the wheel in your car or in your boat, there's no waiting. Onward! Of the so many bridges in Florida, approximately 140 bridges in the Sunshine State are drawbridges. Drawbridges are useful in places where a high level bridge is not feasible, especially due to the aesthetics of the surrounding area. However, drawbridges pose a disadvantage to law enforcement and EMS in responding to emergency calls in that when the drawbridge is up, all vehicle and pedestrian traffic is interrupted. When you approach a drawbridge and the light turns red and the gates lower, you are obligated to stop per Florida Law. The area beyond the closed gates of an operating drawbridge is a dangerous area. For that reason, pedestrians are not allowed beyond the closed gates of an operating drawbridge. Copyright © 2007-2018 Edward Ringwald. All Rights Reserved.